If it is not already apparent by the little fingerprints you may find just about everywhere in the house, children love to explore the world around them through touch. Providing them with opportunities to manipulate objects will not only enhance their learning, but also help satisfy their sensory needs. Here is an easy diy project you can do with your kids to help them learn Arabic, as well as satisfy their urges to touch! This puzzle is so easy to put together and only require a few materials! In fact, its so easy that your children can make their own (mine did). Another perk is that each Arabic sound (letter) is isolated, which facilitates learning, and understanding of the changing nature of Arabic letters. Although this puzzle would make a great Arabic learning tool for younger children, it can also work well for older kids. Its very versatile, so you can decide how challenging you want to make it by varying the length of the words to meet the different levels of your children. 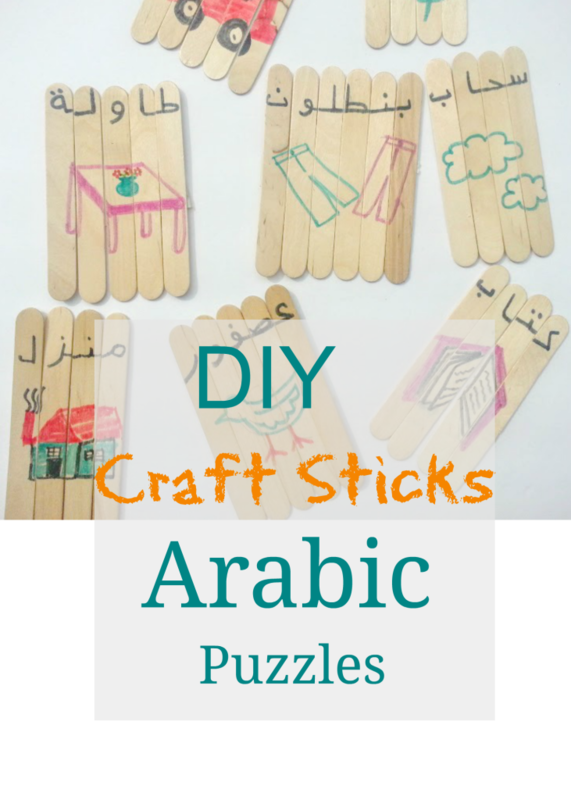 Previously, I wrote about how I use learning centers, and this activity could be used in conjunction with the Arabic blocks or as a stand alone activity for your Arabic classes. I put mine in an empty “fancy” chocolate box to store them. 1. With a strip of tape, tape enough Jumbo sticks together that is necessary to form a word of your choice, making sure it is aligned perfectly. 3. Draw a corresponding picture underneath. 4. Remove tape, and secure each word set with a rubber band to keep them in order until they are ready for use. Tip: To provide more practice, you can also write the Arabic letter in different forms at the back of each stick, and have them match up the correct form of the letter to form the word (see below). Note: For younger children who may need additional support, you can print a list of words for them to reference. Alternatively, you can put numbers on the bottom of the sticks, to provide hints. Assalamu 3alaykum dear sister Josy! what a great idea! it’s the first time I see this! my 4 year old just started to try to write by herself in Arabic mashaAllah and it’s a good idea to make her practice with this! I will also share it on my social medias! ameen! mashaAllah barakallahufiki for your kindness and encouragements! it’s a pleasure! like you I am a mother wanting to educate her child the best she is able to, and raising my child in Arabic since her baby age is a big part of this alhamdulillah! while searching around the web for appropriate teaching/learning resources and tools, I found it difficult to find the right resources as a non-native Arabic speaking parent. it gave me the idea of creating my own resources that we publish now through arabicseeds.com alhamdulillah! don’t hesitate to spread the world around you sister! May Allah give the success in this life and in the Akhirah! JazakAllahu Khair sister, and I would love to keep in touch inshaAllah!